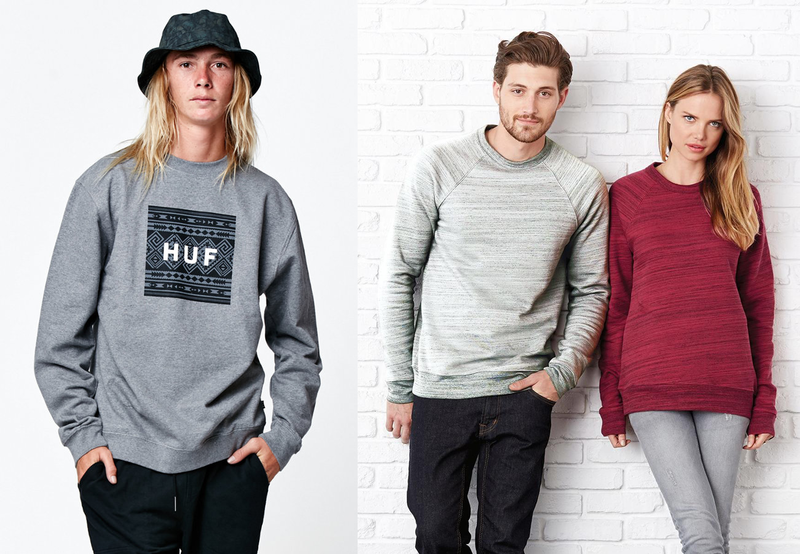 Pullover sweatshirts are a classic staple. With so many options, it’s tough to make your brand’s pullover sweatshirt stand out from all the rest. Luckily, there’s no better time to sell branded fleece! These days there’s so many wholesale variations available just waiting to be printed or embroidered. We’ve got your guide to the most practical options for your brand and the hottest selling pullover trends that are sure to vamp up your line! The crew neck pullover sweatshirt is officially the new hoodie. It’s easy to layer and perfect for those fall nights when its not quite wet enough for a hood! With a clean line, this style offers the perfect blank canvas for printed fleece because there’s no pockets or cords to get in the way. Make it work for your collection: Print your designs onto the front, across the upper back or on the sleeve. Make sure to choose a blank pullover sweatshirt with a dynamic color or texture. Try heather or marbled styles like the BELLA+CANVAS 3901 Raglan Sleeve for a look that will stand out against the competition. Whether you’re looking to print big or small, contrast details and color blocking is one of the best options for your brand right now. 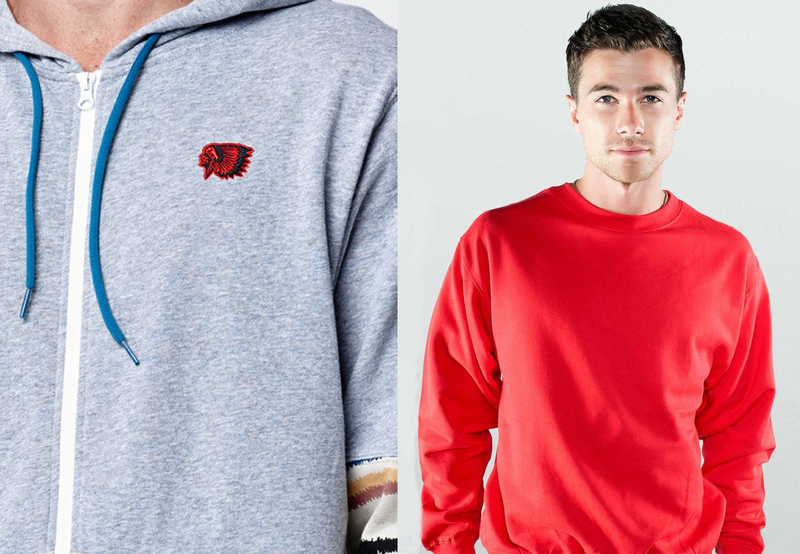 Finding pullover sweatshirts with contrasting sleeves, neck bands or waistbands is a great way to add a little bit of edge to your pullover and make your merch stand out. Try the Alternative Apparel AA3202 Fleece crew with a raglan sleeve—available in 3 color blocked options! Or the Independent Trading Company IND30RC with 5 color options! Picture perfect prints are still a hot item, especially in streetwear. Printing with DTG (Direct-to-Garment) ensures photo-realistic print quality onto any surface that is 90% cotton or more. This process can also be used for intricate, colorful designs that are too detailed and too expensive for the color separation needed in screen printing. While DTG is often used to print the entire rectangular shape of a photo, you can also remove the background for free-standing images—seen here on this American Classics style. Embroidery is a trend we’ve been seeing for a while now and it’s officially the must-have application for Fall 2016. Small embroidered logos add a clean bit of edge to an otherwise basic pullover sweatshirt. Show some personality–try introducing a group of embroidered sweatshirts, all with a funky cartoon design! You can also use this as an opportunity to add a bit of color if you’ve got a neutral palette. The Cotton Heritage M2450 is the perfect economical option for embroidered pullover sweatshirts! The Henley neckline is making a comeback this fall and made its way into the outerwear market. 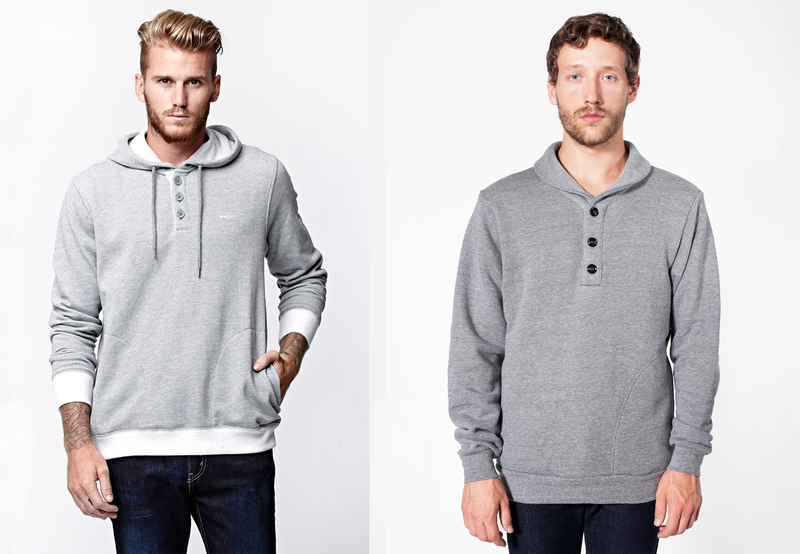 The Henley pullover makes for a unique item that can be dressed up or dressed down for day or night. A good printable henley pullover is a little tough to come by—luckily there’s American Apparel and the RSA4026! The price will run a little higher than your standard hoodie, but if you think you’ve got the customer for it then you’ll probably have success with style! Get ready for Fall Style! We’ve got a round-up of all the wholesale best-sellers and new items for screen printing and embroidery! Ah, the baseball tee. Always a popular choice. The BELLA+CANVAS 3200 baseball tee is a favorite fall style and a year round staple. With ¾ sleeves and many colors to choose from, this style is a no-brainer. The Tultex 0245TC baseball raglan is the economical choice (another customer favorite). The J. America 8874 Triblend Full Zip, on the other hand, puts a modern spin on the classic hoodie by featuring contrast raglan sleeves! With this style you can have warmth and comfort with your favorite drop shoulder. The key to finding the perfect blanks for your clothing line is to pair your designs with garments that are wearable and unique in some way, whether it be the cut of the shirt or the touch of the fabric. Finding pieces with a unique touch is the best way to incorporate new fall styles to your clothing line without straying too much into the trends. 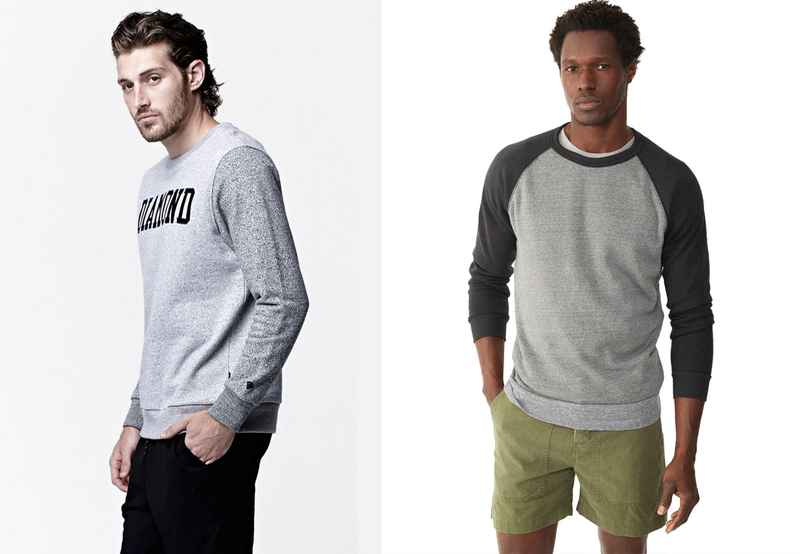 BELLA+CANVAS offers a men’s thermal that is the perfect staple. With contrast stitching, the 3500 Lombard Thermal is a 60/40 cotton poly baby thermal that also offers a rich color palate. American Apparel keeps things California cool with the F397 cropped zip up hoodie. Summer can last all year long with this funky cropped style! Camo is still going strong, for anyone who hasn’t noticed. Styles like the Burnside B8615 and the Alternative Apparel Ladies 9573 offer hoodie versions of the military classic in weathered prints–perfect for adding a touch of fall style to your line! Code V offers its own take on the camo print with the 3916 adult long sleeve crew. Made with 100% cotton this tee can be perfect for working out or just chilling out. The popular ValuCap VC300 Dad Hat even comes in several Camo options! The henley is back! This co-ed fav adds a little pizzaz to your standard tee, making this a classic fav that always seems to come back around. The DT1401 District Gravel 50/50 Henley is another nice choice, with a young men’s fit and three rich colors to choose from. Alternative Apparel spices up the baseball raglan with the AA1989 by adding a Henley neckline and using a cotton/ poly heather jersey. Also made with low-impact dyes! 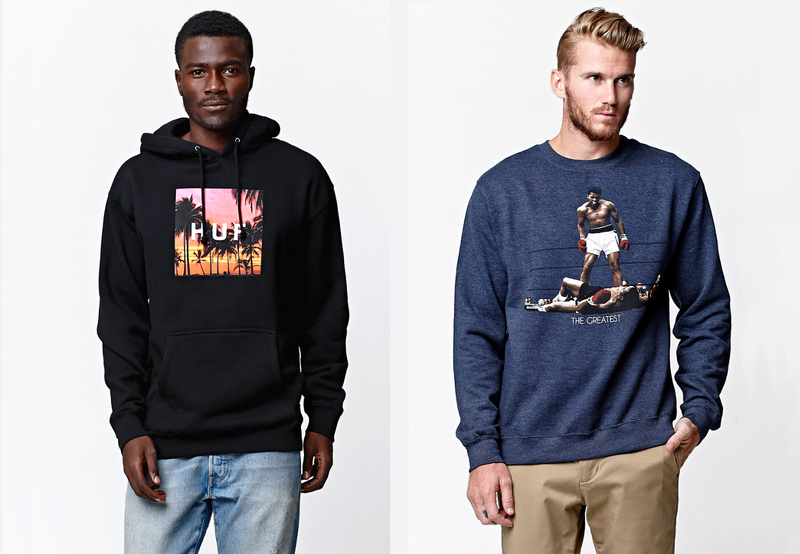 From basic crews to more trendy options, crew neck pullover sweatshirts are making a comeback in the printed and embroidered apparel market. The basic yet stylish Cotton Heritage M2450 Boston Crewneck Pullover makes for an affordable go-to style. The 3901 BELLA+CANVAS unisex Sponge Fleece on the other hand has so many colors and textures to choose from—there’s something for everybody. The Independent Trading PRM2400 pullover crew puts a softer ladies touch on the pullover. This style is perfect for printing or embroidering your logo! BELLA+CANVAS takes it two steps further with the 7501 Triblend Wide Neck Fleece, offering acid washed colorways and contrast baseball sleeves! In the fall, long sleeves are key. The women’s Next Level 6731 Triblend Scoop has a minimal and sophisticated look with just the right fit! Long sleeves and a wide neck make this the perfect layering piece for the ladies. If you need a men’s style that pairs well, check out the Next Level 3601! For the little ones, try the American Apparel BB153 Kids 3/4 sleeve Baseball Tee! This is one of our most popular items on the site and is a surefire best-seller! The Next Level 6021 Triblend hooded Tee is an insanely popular item all year, offering low prices and lightweight protection. Similar, but with more color options, the BELLA+CANVAS 3512 Hooded T-Shirt. American Apparel seems to be one of America’s go-to brands for sweatshirts. The F497 Flex Fleece Zip Up Hoodie is a top-selling fall style every season. A comparable and cheaper zip up style would be the Independent Trading Co. AFX90UNZ! The American Apparel 5495 Unisex California Pullover features raglan sleeves and ultra-soft California Fleece. Whether it be team gear, work uniforms or fraternity letters these hoodies will be perfect for you! As far as basic economical pullovers go, the Tultex 0320 continues to be a hot seller all year ’round! The 996M Jerzees NuBlend Pullover has a more modern look and more color options than the Tultex model. The M2600 Cotton Heritage Juneau Unisex Pullover is also a good choice. A newcomer to the scene, Cotton Heritage has made a name for itself as a go-to brand offering contemporary basics at affordable prices. Whether you’re shopping for your go-to fall staples or looking to add some new fall style to your clothing line, we’ve got all the products and guidance you need!